Bangkok, 11 April 2011. The Tourism Authority of Thailand (TAT) has announced its commitment to social and environmental sustainability in a broad and long-term planning of the hospitality and tourism sector development throughout the country. 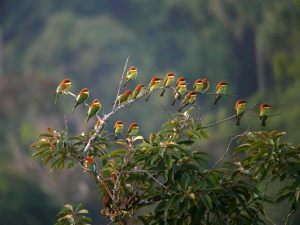 Sustainable tourism helps keep biodiversity at Kang Krachan National Park intact. TAT deputy governor Juthaporn Rerngronasa addressed 300 plus international tour operators and media on the eve of the Songkran festival this year. They had been specially invited to witness the celebrations and inaugural New Year festivities. Rerngronasa shared that as Thailand strives to reach an increased 16 million visitor arrival projection in 2011, it wishes to do so with nature in mind. “In the past, the focus of Thai tourism development was on social and economic development; however, we have changed direction and are now focusing on minimising the ecological impact of tourism,” she said. TAT will take the “three key dimensions of tourism – the economy, environment and society” to ensure long-term, sustainable tourism marketing development. TAT aims to make its newly introduced Seven Green Concepts serve as a guiding force to all of its stakeholders. “The challenges are three-fold: Integration of our tourism to global standard certification, creating traveller awareness and cooperation, plus the greening of the supply chain,” revealed Supaporn Prach-Umpai, vice president of Thai Ecotourism and Adventure Travel Association (TEATA). TEATA, a private sector led network looks at training and capacity building of the tourism industry as it fosters greener operations. Green Heart - to urge tourists to be socially responsible and environmentally aware. Also to help preserve the environment at all tourist attractions. Green Logistics - to encourage more environmentally-friendly modes of transport to minimise direct and indirect environmental impact. Green Communities - to support community-based tourism in both urban and rural areas that place greater importance on responsible tourism management towards conservation of the environment, local traditions and way of life. 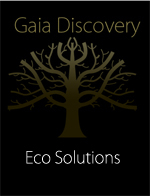 Green Activities - to promote tourism activities that suit local communities well. These provide visitors with engaging and culturally-enriching experiences without compromising the integrity of the environment. Green Service - to urge all tourism-related service providers to create positive first impressions for visitors, and to win hearts and minds by attaining higher quality assurance standards while demonstrating respect, care and concern for the environment. Green [Plus]+: to encourage Corporate Social Responsibility (CSR) among operators by encouraging them to support communities in which they operate. Businesses should also look at energy-saving initiatives or develop renewable energy sources and environmentally friendly products. 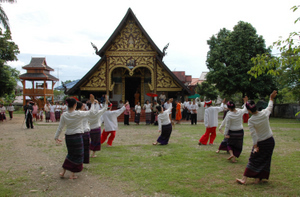 Chiang Rai eco-tourism takes you to the heart of old traditions. With this new direction announced by TAT, I asked two operators what they thought. James Wharton, head of sales with the all-new Renaissance Bangkok Ratchaprasong said, “It’s about time!” Having worked in different countries, the Australian-born hospitality executive thinks a lot more can be done to improve the environment. “Marriott has a number of initiatives around the world, from preserving the rainforests in Brazil to China where we work with local communities to help preserve the largest fresh water deposit in the world,” he enthused. “Our Marriott International HQ near Washington DC is now carbon neutral - something that we are very proud of,” he smiled. Wharton said he looks forward to introducing changes at Renaissance Bangkok through his involvement in the green committee. Thailand offers many rafting splendours through amazing rivers. One nature- and adventure-based operator based in Phuket was less enthusiastic. Dave Williams of PaddleAsia would rather see concrete actions that would actually protect the environment and develop low-impact useful resources. 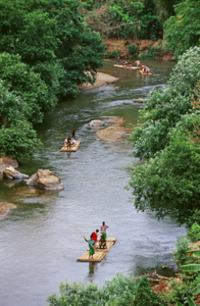 PaddleAsia, an environmentally responsible and ethical tour company provides guided explorations and treks such as bird watching, cycling, orchid discovery, kayak/canoe paddling and rock climbing. Williams, an American who has lived in Thailand for more than a decade also conducts courses in coastal and jungle survival plus bushcraft. “Historically the TAT talks about sustainable tourism and eco tourism, and has a few conferences – usually in very un eco-friendly mega resorts – and hands out eco awards mostly to mass tourism companies that have nothing to do with low impact tourism,” he wrote in response to a query. Williams described a number of instances where he had written to TAT addressing several environmental issues only to go unheard. “Not even a thank you note in reply,” he said. “Khao Sok National Park, one of the most impressive places on earth, is not as well managed as it should be,” he asserted. Visitors pay 200 baht admission fee each, yet, according to Williams, this does not translate into motivated well-paid staff, vigilant rangers, low impact facilities such as solar-powered national park bungalows, or even protected wildlife. He has personally spotted two poachers in action and had them arrested for killing a Gaur and poaching wild orchids. 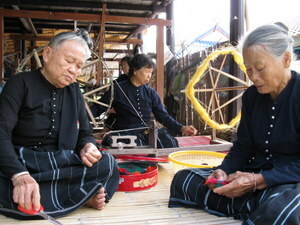 Rong Ngang ladies love their culture, and hope to keep it for a long time. "Other ways of signaling a clear intent on moving towards sustainable operations is to channel funds into installing solar panels, employing more park staff to patrol the parks, clean up trash regularly, and more,” Williams suggested. Despite these criticisms, the move will look at a range of elements to improve green tourism in Thailand. These will include managing short-term market recovery from the recent downturn, long-term market expansion, improved economic revenue and preservation of ecological assets. TAT will continue to promote golf, health and wellness, cuisine, and shopping to travellers as before, and hopes to achieve a nine percent increase in tourism revenue from last year’s 585 billion baht to 600 billion baht in 2011. The Thai Song Dam, a Laotian ethnic group, converge at the cultural centre in Khao Yoi distict of Phetchaburi to celebrate the New Year. National park upkeep, wildlife protection and green capacity building are areas all slated for looking into even as TAT looks at influencing the general tourism and hospitality sectors of embracing the principles of environmental sustainability. Hotels and resorts are urged to review their operations with quality and environmental guidance stated in the Green Leaf Certification Programme. As of now, there are 220 hotels in Thailand with Green Leaf recognition, and 535 smoke-free hotels; over time, these figures are bound to grow. “The philosophy of green providers should be ‘Resources and the environment are the real capital of our business’,” said Prach-Umpai, stressing the socio-economic benefits of TAT’s new direction, as well as preserving communities, culture and nature. Photographs courtesy of Tourism Authority of Thailand (TAT). Gaia Discovery thanks TAT, Thai Airways and Renaissance Bangkok Ratchaprasong for their kind hospitality during this media coverage. Read article on Green Routes in Thailand.